Brazil’s economy received somewhat encouraging news Monday when market analysts revised inflation forecasts for 2013 from 5.71 per cent to 5.70. In 2012, inflation rose to 6.15 per cent. The central bank maintains an inflation benchmark of 4.5 per cent, with a two percentage plus or minus acceptance threshold. While the change may at first appear nominal, it signals that Brazilian President Dilma Roussef’s policies to revitalise the struggling economy may be working, albeit slowly. But the forecast also slightly trimmed GDP growth to 3.08 per cent in 2013 and 3.65 per cent in 2014, according to a central bank survey of about 100 analysts published today. Although this marks an increase over last year’s growth of just 1 per cent, analysts are worried that inflation will delay already slow economic recovery. In February, consumer prices are expected to rise 0.42 percent, up from a previous forecast of 0.41 per cent. But Brazilian officials have been trying to allay consumer and foreign investor fears that its economy has seen its heyday come and go. “We have good results. Lowest unemployment rate in history, systematic reduction of poverty, reduction in interest rates, significant foreign investment in the country,” Gleisi Hoffmann, Brazil’s Chief of Staff said in a recent interview with the Brazilian newspaper Folha Sao Paolo. 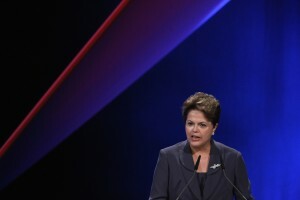 She said that the Brazilian economy is resilient, denying Western media reports of crumbling investor confidence. Nevertheless, analysts are saying that Brazil needs to tread carefully. They point to Brazil’s economic growth, which stood at a healthy 7.5 per cent in 2010, as having been battered due to the recession still beleaguering Europe and declining demand for Brazilian goods. Roussef in recent months turned to cutting electricity-taxes, extending payroll-tax cuts, and lowering taxes on cars and clothing in a bid to slash inflation and get the economy out of its virtual freeze. However, positive figures such as its 5.5 per cent unemployment in 2012 are only set to improve as the labour market looks to hire again. In December, the unemployment rate was down to 4.6 per cent.